Former Chief Magistrate Juliet Holder-Allen yesterday stated that allegations that a vehicle she owns was at a house where ‘channa bombs’ were made were “a blatant lie”. “All the people who are my supporters, who prayed…who are following my story on the road of injustice, can fill the streets of Brickdam today to show that good will triumph over evil,” she told Kaieteur News. Mrs. Holder-Allen is the presidential candidate for the recently-established National Democratic Party, and she warned that there “will be problems if I am arrested and thrown in jail”. Vehemently denying this report, the former Chief Magistrate said that only she and her husband drive her vehicle. She added that on the night before the torching of the Ministry, she and her husband retired to bed around 07:00 hrs and were still there when the building went up in flames. And responding to President’s statement that she was seen protesting outside the Police headquarters the day before the fire, Mrs. Holder-Allen wondered whether she was being victimised for that. The former Chief Magistrate also queried whether the police were pursuing with the same alacrity, the persons who murdered her brother, Mineo Holder, some 15 months ago at Linden. On Monday, Mrs. Holder-Allen told Kaieteur News that two senior police ranks, whom she named, visited her South Ruimveldt Park home around 15:00 hrs yesterday when she was out. 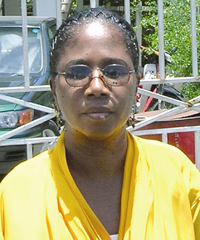 On her return, Mrs. Holder-Allen said she was informed that two police officers, whom she identified, had stated that she `was wanted for questioning at the Brickdam Police Station. Mrs. Holder-Allen also said that police officers again visited her home again yesterday.